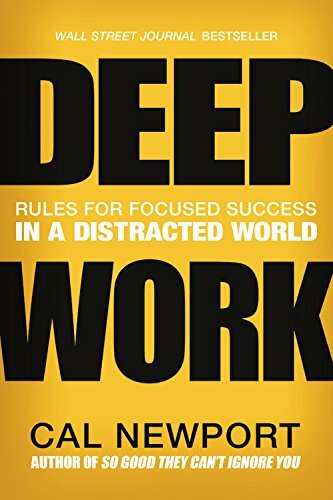 Deep Work: Rules for Focused Success in a Distracted World One of the books that inspired us to create Team Helium. Do you want more time for thinking and discovery? Buy this book and read it twice. dental hygiene that we practice every day it’s a little bit weird that we have dental hygiene that we practice every day but you know most people probably couldn’t name one mental hygiene practice every day and I’m just going to throw out the suggestion that maybe your brain is more important than your teeth. At the dentist can come fight me on that one but but I think one practice that’s just it’s healthy for all humans in general. So just keep some kind of a like a journal or gratitude log or something I answer one of the habits for me that’s been. Get the biggest benefit to me this year has been Duchess I have a journal and every single morning three things I’m grateful for that can be personal they can be professional. [0:43] Welcome to helium podcast I am Christian Ogilve Hendren here with Matt Hotze on today’s episode we chat with author Matthew Kent. he publishes regularly in blog format the math you can. Calm and he often publishes on medium.com as well. I know where conversation left me with lots of food for thought on my own habits and how I treat my own brains face. Yeah for me technology is both a hero and a villain and between an email social media and all other forms of communication it’s a constant stream. Leaves me feeling overwhelmed and without a day-to-day strategy or how to combat technology in my life so I was really happy to have Matthew on the show so we could. Walk through some of these strategies with him I’m glad we got to talk to Matthew and walk through one article of his in particular about specific strategies for mental hygiene around technology to your point man. in our lives plenty of it in. around it I was particularly interested in the parts of it where we think we’re solving a problem and maybe adding to it. trying to engage your minds purposefully in the practice of science and engineering. from his medium.com polishing for our audience so if you check it out on the show notes page she’s actually put all of the pieces that he thinks are most relevant to our folks in one place which is very kind. So without further delay let’s get into our conversation with Matthew Kent. [3:38] Or welcoming to the show today Matthew Kent’s who is an author and entrepreneur welcome Matthew. [3:45] Hey thanks for having me I am grateful to have this conversation with you today yes we are to speaking of grateful we really have. Welcome to hear for selfish reasons because we need your therapy and coaching really want to get better at navigating this world that we are in with all of these different. out of our own way and you have some very practical and extremely Salient advice that we can’t wait to take your brain about and then you know we’ll record it for our listeners to. [4:26] That sounds good to me. be up there beside the five ways technology is destroying you and what to do about it. points I think it was five of them in terms of the problems that technology creates for them for for us for everybody and so I was thinking we can just kind of walk through some of those problems in and just have a discussion about it. you know we wouldn’t even be able to have and distribute this conversation without you know many of the technologies that are. I also have some of that the negative aspects that that I do want to talk about what it is because everything is a double-edged sword and you know there’s always positives and negatives that we should be at least a little bit concerned of. are being affected by you know what we see around us and. and I one of the things that was mentioning is listen to it used to be the case that. Our people were able to sit with themselves sit with their own thoughts their own ideas and turn inward into their imagination. You know when encountering boredom will now when we encounter boredom I mean what do we do when we pull out of screen. I mean you just watch it around you know the supermarket wherever if somebody is forced to stand in the line for more than 4 seconds the screens coming out. [6:49] And so we were able to be engage wherever we are and so we don’t have to turn inward and so there’s this sense in which. You know that there is that robots are whereas before you were you know thinking about things Loosely making connections and now you just have this never-ending stream of stimuli to respond to. Which is he know not something that anybody’s ever ever had to deal with. I like your own emotional well-being. At one of the things that some of the preliminary studies are noticing is that children today are suffering with very high levels of anxiety. And I’m sure it’s the adults to just because you know you were gone. [7:44] Social media and you see things that are like you know so and so is having a baby and somebody else got a promotion. And you know you’re looking at all your academic friends and you like to go you know they got this grant that I didn’t get and you know they got their paper finished and. You know here I am finding feeling like I can’t hold everything all together and because social media setup to to show the highlights and only the highlights. You know there’s a few people are sharing their struggles but but overall it’s like you’re not seeing the people who didn’t get the grant. Write your do not seen the people who are trying to have a baby and and they’re not successful. and I you know here I am and I can just barely you know stay afloat. did you ever see that show The Greatest American Hero I did not. he weighs or people just kind of self diagnose what are the categories that I’m injuring myself with my you know. you’re unoriginal like you’re not just kind of getting your mind around the things that you need to get your mind around that’s a pretty good indication that you might be sort of chronically distracted. very focused mindset and and then we we try to work through something. [11:18] But then it’s actually during the time when we we we rest and take a break from that. and so you know neuroscientist but my talk about this as you know Focus mode versus diffuse mode the psychologist a no condom in the Nobel Prize winner in his book Thinking Fast and Slow he called these system 1 and system 2. And we kind of we operate off of this you know back and forth between the two it’s almost like you know a game of ping-pong wear as long as the balls going back and forth you know that’s. That’s the state that we should be in. And what happens sometimes with our technology is that it provides distraction into our time of focus. So that our brain isn’t really able to go deep. [12:09] And so you know whether that’s notifications on your phone whether that’s you know trying to multitask so you’re checking email while you’re also supposed to be writing a paper. [12:18] Or whatever it is you know you’re you’re not focusing like you should be. Then you’re also not resting like you should be either because then it comes time for your mind to unwind to relax. And instead you kind of have it in in reactive mode where you have to see no maybe feed on your screen and whether it’s your email or whether it’s Twitter or whatever it is you’re your mind’s not free to wander but your attention is captured and divided. [12:43] And that’s extremely problematic because you’re supposed to have this back and forth between very focused and then mind at ease. and so what we really need is you know to have that space where we are going to shut the door to the office we are going to let you know. Put the phone on silent we are just going to look at what we’re doing and only what we’re doing. object in the universe and I mean it can do some incredible stuff if we just get out of the way and let it. [13:39] What are the things that I want to go back to what you mention is multitask and thing that caught my eye in the article was talking about this idea. idea that people would conviction tenuate convince themselves that this was the right way to go right you know I it’s I think the Allure of multitasking is that it helps you feel busy. [14:19] And I think we all want to feel busy because feeling busy somehow we equate that with being productive. But just because your hands aren’t idle doesn’t mean you know that you’re accomplishing something important. And so it’s hard to lose that that sense of like okay well here’s the the output of my work right now but here’s what it could be. Spider brains are very bad at imagining what what is not there you know it’s yours what could be if I were to just you know do these things one after the other. that’s a good example of this is if you’re writing. operating right now you can come back later and edit it but what happens if you stop yourself and you start to edit what you’ve written. Your brain switches back and forth between a task that it was doing which was coming up with the next idea and then doing a new task which is now fixing what was there before. [15:35] And the problem with that is there’s a cognitive load associated with with switching and so you’re slowing yourself down without realizing that you’re being slower. I put your feeling really good because you’re like all well with this amount even have to go back and edit this like I’m saving so much time and you’re probably becoming less effective less productive. and so it’s a sort of like perverse incentive that’s happening what you’re getting is dopamine hit your brains feeling really good but at the same time it’s not being as effective as it should be. your email is a list of other people’s agenda for your time. [17:31] Right which which is fine like you mentioned there might be good reason for other people to want to have claims on your time and there might be you know incentive that you have to want to then you know meet them and and and their demands especially if it’s like your boss it’s like yeah you better reply to that email. But at the same time you know there’s this sense of. What technology does is it makes us reactive and so you have all these forces that are working together to make us react to things. so we’re not reacting to everything in the world is throwing to us and just responding but that were contributing things to the conversation that we’re pushing for new insights that we’re doing real work that we can be proud of. And so yes there’s a sense in which you know there’s always got to be this this digital communication but at the same time it’s like we just need to be careful. Because we need to make sure we have enough battery setup that we know that we are for the most part making progress and then everybody else can kind of that’s a secondary thing. I want to get into those because that’s the most I think the most practical thing that people can take away from this but I want to touch on another problem which I think actually relates to Academia the problem of. [19:07] Empathy going right now because. Everything is just a digital I mean even if it’s a picture of a person decision digital object in some ways and that this idea that. You’re almost like the humanizing people cuz you’re just interactive a screen so I wonder if we could talk a little bit about that because I think it’s I think. has always been regulated by the speed of communication and so emails faster than anything that’s ever come before it and it has the advantage of it doesn’t have to be why you can send a message and you know they get it on their own time. What sort of at each level that you add something more personal back in it becomes more possible to have real empathy. And I think they’re the real Tipping Point is the point at which you have eye contact. [20:16] And you know I mean obviously you know we into it people’s emotions from looking at their eyes and you know their eyebrows can kind of tell you the expression. Little children do this all the time you’ll see them looking into your eye and may even if you’re a stranger that you to walk in and what kind of look at you and and size you up and you can like look right into your eyes and actually so. What are the things that psychologists have been studying for a long time I know I think it’s actually a novelist who coined this term it’s it’s the meeting Eyes Of Love. And it’s this idea that critical to a child’s well-being and especially an infant a baby would be that the eye contact at it it makes with its mother. one of the books that I read I think I mentioned already it was by the the the MIT Professor Sherry turkle and it was called reclaiming conversation that was part of this idea is listen we’re we’re so much part communication now is digital. connect to people face-to-face look them dead in the eye and remember that they’re a real human being remember that you know that there’s there’s emotions that they have to everything that we say and I. [21:34] This aspect of communication of of personal communication is always been part of what it means to be human and so I think in terms of quality of life. You know it is all communication goes digital everyone’s quality of life is going to take a serious head and we all need to be thinking about like me and how much I contact if I had today so I think that’s a. If there’s a way to track that metric I would bet that would correlate pretty highly with people’s overall happiness and satisfaction. [22:03] I actually have to follow up now cuz you just said that tracking metrics so am I science meter went on and so Christine Christine does a lot of work. [22:13] Working and I do a little bit of it working with on team science Concepts and we’re always thinking about how do you track the effectiveness of how a team is working together. I bet if you could measure teams and compare the amount of eye contact that might be correlated between different teams that might be correlated with affect effectiveness of the T.
that’s right yeah and so humor and I wonder if those two things I contacted and laughter are even correlating I mean they don’t Nestle need to be you know you can have a hysterical phone conversation with somebody but commuting interesting thing you know because. you’re bigger early but but maybe also sometimes literally that they have going for them. For listeners of course his contentment adjust to the idea that contentment goes down and just maybe you can speak to that a little bit. [23:55] Yeah I think there’s really two primary ways and it might be more why this is happening and I think one of them is just a comparison thing I think I hit on that a little bit earlier where you know you can look and see somebody else’s highlights. and the other thing is advertising now advertising is nothing new what’s it’s been around forever and you know the advertisers have wanted to get in front of your eyeballs and deliver your message that. you came back and you Justified it to yourself. and one of the things with the technology in the rise of prickly like social media is that there are companies like Google and Facebook. it’s about literally is Facebook’s you know that’s their business model is they say hey we have a bunch of users and we have their data. you know now what you say you’re going to advertise to ex many people but we can say you’re going to advertise 2x many people who have this interests with visited this page who are this age of this gender because we have all their data. And so if you ever had that experience where you went out and you thought about buying something and she kind of had it open on your browser Tab and then you went to Facebook and they’re advertising it to you it’s because they know what you’re doing. And so you have this personalized advertisement where now they can make you discontent because they know what you want because they know who you are. I don’t really care too much you know now that there’s not that problem that advertises Housing Works is like we’re just not going to show it to that demographic we’re going to show it to the end of 60 year old men that we thought we were showing it to. invitations to special issues and you’re getting tons of weight you know invitation to certain conferences and you’re seeing. LinkedIn how glossy somebody else’s website are that you know right and there are a million different. Indications of everybody else’s success because we need to build that up so I’m feeling like you’re always behind I guess is it is a big. Danger not only from the technology but just the culture of Academia so just kind of putting the blinders on and being intentional seems like a good takeaway. you know it’s easy to do that you look at some other professors website you like man it’s sleeker than mine and okay but houseleek your website is doesn’t really determine how good the content is in some people don’t even notice that stuff you know you’re noticing it because you’re comparing. You know somebody else who visits your website isn’t comparing they’re just visiting your website. [27:44] And then yes it is that that one you know aspect of perspective and there’s also the aspect of like listen sometimes you just got to put this stuff away and say. You know I’m going to go and you know just be happy for what I have I think that for academics and really for all people in general. When practice is just a healthy practice I’ll call. most people probably couldn’t name one mental hygiene practice every day in it I’m just going to throw out the suggestion that maybe your brain is more important than your teeth. Did the dentist can come fight me on that one but it’s healthy for all humans in general. [28:29] So just keep some kind of a like a journal or gratitude log or something I answer one of the habits for me that’s been. and it’s really simple and you know probably takes just as long as brushing your teeth. But it’s one of these things that that’s so critical to your own well-being and your own ability to say hey I could be discontent I could go out and start playing the comparison game or I can be grateful for what I have and and Lujan. I think that’s related to you know one of the approaches that you should guess the article which is Amina maybe a mini Tech freespace but it’s a tech free space where you’re using physical pen and paper yes who. it can be expensive it can be cheap doesn’t matter in the morning can you wake up a little bit before you need to you can be just 5 or 10 minutes. And it’ll go through like a mansion with the Gratitude just three things that you’re grateful for and then no more than three things. [30:12] I’m really I would even say maybe one is best for this that you really want to accomplish that day. So you know we all have a bunch of things that we could be doing we all have a bunch of things that we want to be doing. What one thing could you do to win the day if I got this done today is a win. it’s just you turning inward. [30:48] You know analyzing I believe I think it was Charles duhigg did the author habit get a quote that I heard one time that I really like he said that. those that are the best at identifying their deepest most important desires and so I think that’s a practice that we should all have is like what really are like my most important desires like what’s the thing that I need to be doing today. And so I think you know. The time in the morning you know having time that you turn inward having time that you in a sort of set the foundation of gratitude and then set the direction. With what your priority is I think it’d be a really powerful practice for a lot of people. yeah I think your reference in these this article it’s by Khalid Newport who’s actually an academic yes Georgetown and this book is. hundreds of years ago there wasn’t the social media that wasn’t the technology that’s just. she she lives you know way out in the woods during part of her childhood and she credits to this with being a very fertile time for her imagination like listen to wasn’t a lot to do and we weren’t like out watching TV we weren’t we knew you just Kinda hot. Play games and you kind of hard to imagine things. and I’ll let you know another quote that I love it it comes from the book I think I’ve already reference. Reclaiming conversation by Sherry turkle she says and I hope I get this right she says. Stop boredom can be recognized as your imagination calling you. [34:19] And you know I think that word imagination you know that it’s obviously important for people who are writing fiction but I think it’s important to let you know for the academics for everybody because you know it’s important to remember that. The real work that we do regardless of what we’re doing is fundamentally a creative or you know that nobody we’re not in school anymore where there’s. if we’re going to do real work there needs to be some real creativity happened we’re going to have to exercise that that imagination component of our brain are to be able to bring something worthwhile to the table. this space for a flow State you know to have all the things and I when I get a nut. how do you set aside this time to allow your brain to get into that place that you recognized as a generative state. [36:02] Right until you know I I think we talked about the the morning. our brains are going to be more most productive. you know if there’s anything that’s bothering you this is another good time to journal you can sort of jot it down to get it you know we’ll call it off your mind and to help you go to sleep better. And so you know that way I I think if you’re beginning your day intentionally. [37:25] You know instead of in a reactive mode but no proactive mode I know you’re listening what you’re grateful for your figuring out what your priority is and if you can end the day in such a way that your. You’re entering into that rest and leading into that sleep in your getting enough sleep and I think that both of those at this powerful 1-2 punch. [37:47] Yeah and I think for the the folks who are may be addicted to checking off to do. List you can just say that this is you know putting your brain into this restful state is. I can reply publish it today if I scheduled it today to publish later on medium.com I was about to destroy things by Tyler at something to the effect of. Here’s the most productive thing that you can do with 10 minutes alone. Ann. You know just people from all sorts of disciplines over the years have have reported the benefits of just you know going on a walk. The walk has the advantage of you know it’s not too difficult your brain can kind of do it on autopilot and you know there’s interesting things that you might see on the walk. [39:19] But there’s nothing so demanding that it’s going to capture your attention the way that like a screen wood. [39:25] And so you can kind of sort of half focus on the things that are round you maybe get some inspiration from them your brain can kind of relax unwind maybe sort of happy thinking about what you were working on. is kind of like a like a bowling alley with bumpers on it. And so when you’re focusing there’s not a lot of room that your mind has to operate because and you know this is been has been all kinds of Dino psychology experiments on this work you know you can do different things and people won’t notice because they’re the dialed into something. [40:05] It’s like you can you know if I think it was a good one experiment where people would not notice you switched out the. you know your brain is still kind of working even though it doesn’t seem like it’s working it seems like it’s being lazy because it’s not being taxed and not focus mode. This is actually a very productive time and a time that’s necessary to make the the focus time better. helium and so I got several things there at one of them is a free. PDF ebook of a productivity I that I wrote called the ultimate daily checklist 13 steps to winning the day. the book that I wrote my first book published it on Amazon Kindle and it’s called personal finance that works for you. [42:56] And I’m just really you know I mean money is one of these critically important topics we don’t talk about nothing it took me a long time to get my head around it and I wanted to share what I learned with other people so. It was actually the fruit though of some of the strategies. I want to been possible without the things that were talking about today. for being such a great Castle guys thanks for having me on I really am truly grateful I think it was a great conversation and I really appreciate what you guys are doing and I wish you guys the best of luck. [43:48] Thanks everybody for listening to episode 17 of helium podcast. Today we talked about technology and your life and your creative life and your professional life and how have those Technologies are always going to be there. [44:03] It means that we have to think about ways that we can actively battle against those. Technology technological intrusions which means. You need to set aside time during your day to do mental hygiene I love the concept of mental hygiene for Matthew Kent. It’s awesome I think he’s going to have some dentist after him but he’ll probably have some brain scientist that are cheering him on to encourage people to do that kind of thing on a daily basis. If you want the notes from this week’s episode you can go to www.com helium. Episode 17. You can also go to Matthew Kent special page that he set up for this episode. [44:45] The Matthew kent.com helium where he’s put some articles that are of special interest to possibly to this audience so we really appreciate Matthew setting up that page coming on the show really talking about his. Awesome ideas for how we can combat technology in our life. [45:04] Another thing to note about this episode is that the music was provided by Michael Blake he can be found at Tim Blake music.com. take care and we’ll see you in the next episode.